Having trouble understanding the fundamentals of electricity? Problem solved! 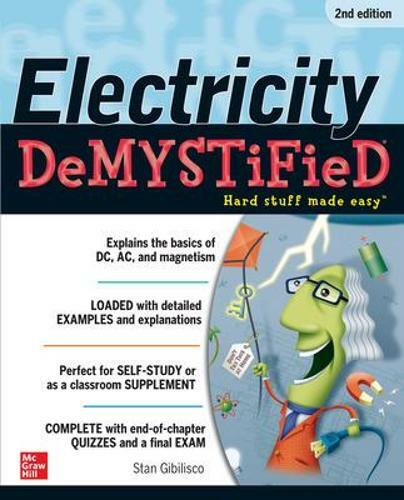 Electricity Demystified, Second Edition, makes it shockingly easy to learn the basic concepts. Written in a step-by-step format, this practical guide begins by covering direct current (DC), voltage, resistance, circuits, cells, and batteries. The book goes on to discuss alternating current (AC), power supplies, wire, and cable. Magnetism and electromagnetic effects are also addressed. Detailed examples and concise explanations make it easy to understand the material. End-of-chapter quizzes and a final exam help reinforce key concepts. Simple enough for a beginner, but challenging enough for an advanced student, Electricity Demystified, Second Edition, powers up your understanding of this essential subject.